I’m so excited to be working with Glidden to do a mini makeover in our bedroom. It’s been on my to-do list forever, but always seems to get pushed to the back burner. With a new baby in the house, a small and easy project that makes a big impact is in order. Here is a peek at what our bedroom looks like right now. 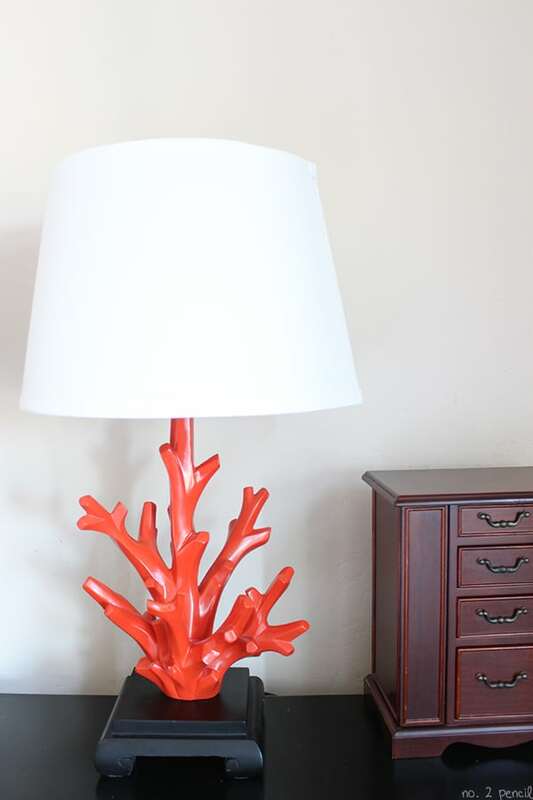 My favorite part of our bedroom are these great orange coral inspired lamps I bought at Home Goods a few years ago. I’d like to use the lamps as my inspiration for the project. I really love them, but I don’t think the neutral beige paint shows them off very well. 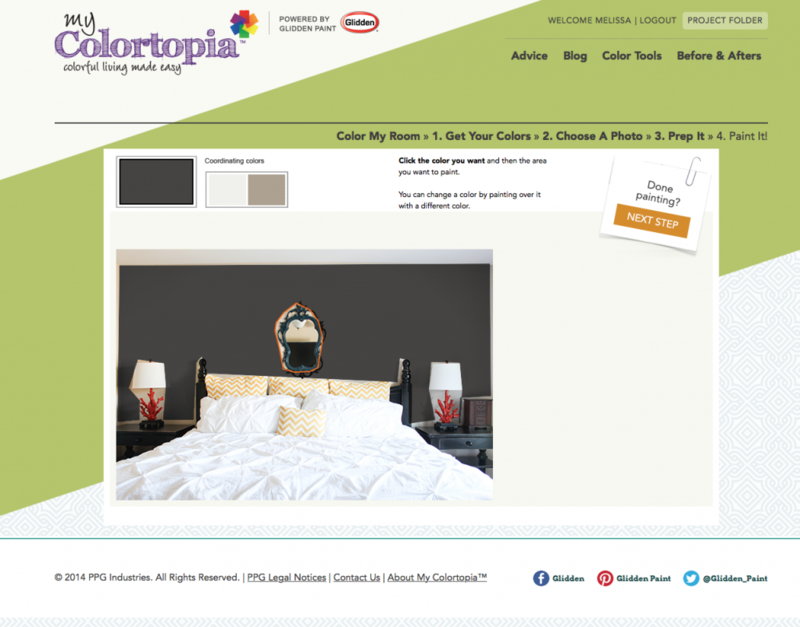 So, I decided to visit Glidden’s My Colortopia and try out some paint colors. 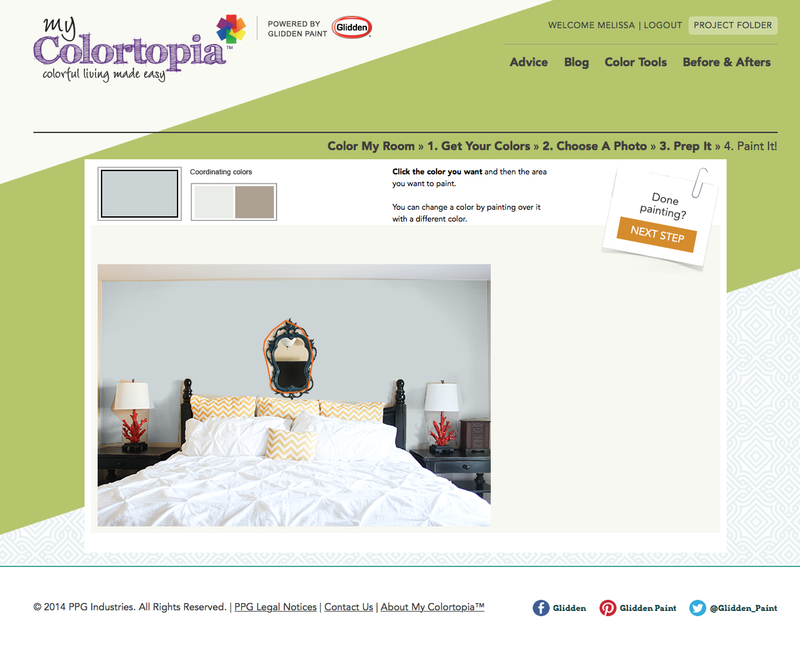 I used My Colortopia to decide on paint colors for my son’s room last summer. It’s such a great tool. You upload a picture of your room, then mark off the area you want to paint. Then you can give the sample colors a try. The color tools are fun to play with, so it’s easy to get lost in creating. I tried Light Grey and a Deep Onyx. 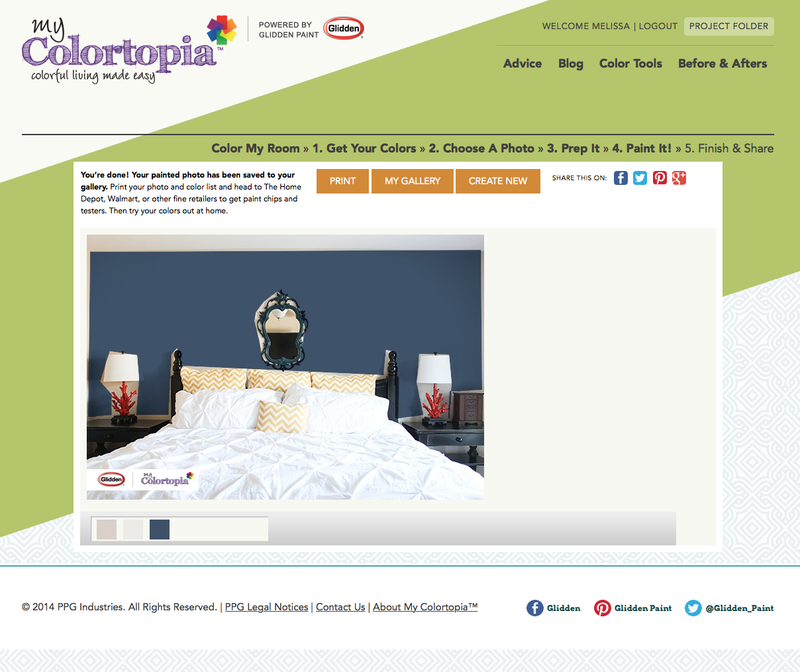 I’m pretty sure I found a winner in Glidden’s Rich Navy. I just love the way the orange lamps pop off the dark blue paint. We used this color in my little guy’s room too, and I absolutely loved it. I wasn’t planning on using the same color again, but once I saw the visual, the deal was sealed. 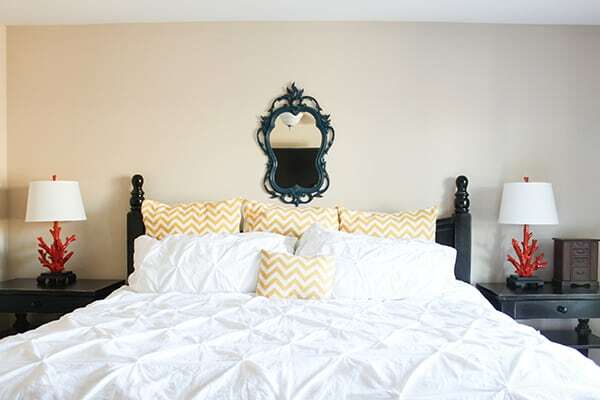 So here is another look at the before and I can’t wait to share the mini makeover next week! I have been sponsored by the Glidden brand paint for PPG. The thoughts and opinions expressed are my own. I’m so loving those coral lamps. We have a beachy theme through our house. 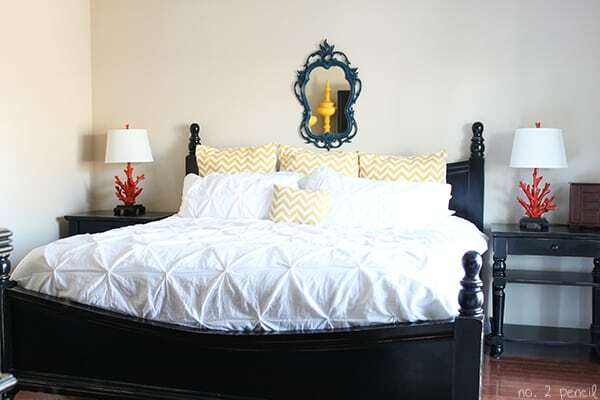 (I have been away from the So Cal beach for too long) But I’m really loving the room preview for the paint. I will definitely be doing that. With all these fresh new walls – they are screaming for some personalization – but it’s a little scary at first. Thank you! Yes, it is so hard to get started! I LOVE the colors you picked! Fun and vibrant but still relaxing for a bedroom. The mirror and lamp are TO DIE FOR! Thank you, friend! It’s so nice to spruce up the bedroom! 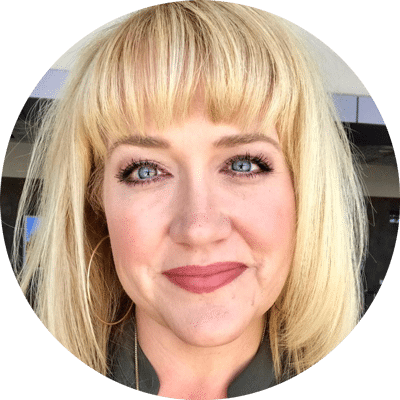 Melissa I love your website! I think the wall color is perfect with the coral lamps – it really makes them pop. I would suggest using a larger mirror over the bed. It looks a little out of proportion to the headboard. It is a really beautiful mirror but this might not be the right spot for it.